Gamesradar - "If you’re looking for the stealthy surprise of 2017, Sniper Elite 4 might just be it." IGN - "I immediately wanted to jump back in and try again. That’s a very, very good sign." PCGamesN - "...a broad, inventive killing sandbox." 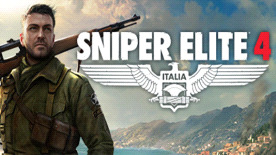 This is the the 4th Sniper Elite game in the series, and we can’t wait to jump back into the shoes of OSS agent Karl Fairburne as he assists the italian resistance against the Fascists. Sniper Elite 4 comes with some great gameplay improvements! Such as an upgraded map system, far more intelligent AI and an upgraded X-ray kill cam which is always a fan favourite. We cannot wait to get our hands on the 3rd person tactical shooter.